Premuda is the westernmost island in the Zadar archipelago and is situated southwest of Silba and northwest of Škarda. Its waters conceal an exceptionally beautiful cave, in fact, a complex of small caves, called Katedrala, which received its name due to its huge cupola-shaped hall with a porous ceiling. Light penetrating the cave from various openings lends the sea a turquoise hue. 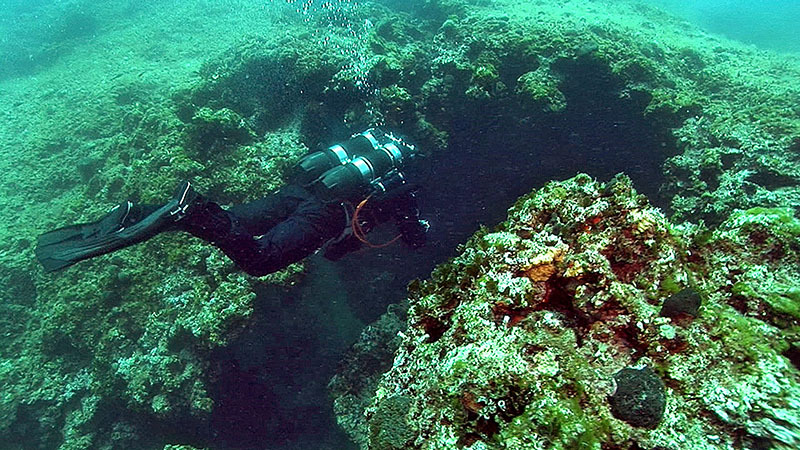 The site is reached by boat and marked by an anchoring buoy above a plateau at 6 m. The dive starts from the buoy, down to the plateau and then on to one of the openings to the cave. This approach is slow and drops to a depth of 30 m and the larger hall which contains an opening on the right wall (18m). Following the right side of the hall, 20 m along there is a narrow tunnel named ‘The Chimney’ leading back to the plateau which is wide enough for only one diver. For more advanced and adventurous divers, there is a tunnel running to a depth of 16 m next to the main cave entrance at a depth of 50 m.
On the plateau there are spider crabs, octopi, rainbow wrasse, while the cave abounds in sponges, corals and polychaeta. Mullet, white two-banded and sheepshead bream, and the occasional school of greater amberjack inhabit the sandy seabed.